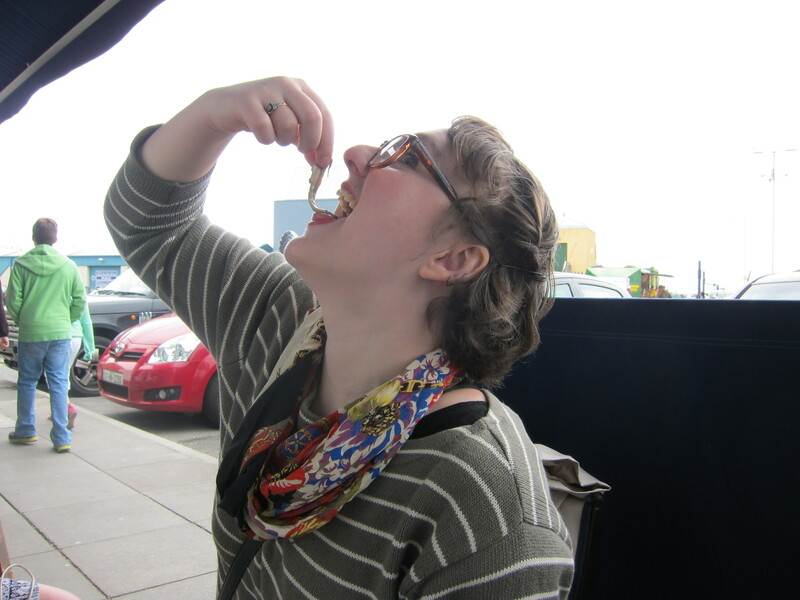 I seafood, I eat it – Howth and Prawn Curry (and how to caramelise onions in 5 minutes) « Eating for Two, for One. nobody looks good eating oysters. Nothing you can get in Canberra (inland) compares with Howth – but this is my delish prawn curry. I created a base with roasted red peppers and carmelised red onions – so this is a very sweet and hot curry that can be ready in a half hour if you’re a speedy chopper. Its based on a curry recipe from the south of India, but is decidedly inauthentic and just my preference, rather than ‘true’ to the region. Still, definitely worth a go! Fry diced onion in oil on medium heat, in a large pot. To caramelise the onions quickly, add the bicarb when the onions have started to sweat. Cook for 1 minute, or until starting to break down and brown. Add in peppers and fry for a further 2 minutes. Add in rogan josh curry paste and stir until well mixed and fragrant. If there are any spices you particularly like – I add a sprinkle of garam masala, turmeric, and ground coriander/cumin – this is the time. Play with spice as your heart desires. Next, add in the carrots, potatoes and then tomatoes, stirring to coat after each addition. If adding in extra chilli (I make my own curry paste which is quite hot, but store-bought often needs some help) separate the veggies, add a little oil and fry in the middle. When everything has been added to the pot, add about a half a cup of just-boiled water, cover and steam the vegetables until softened. After about 5 minutes, everything should be soft, and the paste should have created a thick gravy to coat the veggies. Finally, stir in the raw prawns and cover. Cook (lid on) until everything is ready – the prawns are opaque and pink, the potatoes are soft, and the carrots are ready to be eaten. Serve over rice (basmati), with natural yoghurt and coriander. I have been using herbs from my garden recently – so I made a yogurt sauce with lemon, yogurt, minced chilli, and a combination of parsley, chives, and mint. Delish! I LOVE IT! The story, the photos, the recipe. Thank you for sharing with us! Love seafood pics and recipe for prawn curry. Thanks for visiting my blog. Fabulous recipe: quick, tasty and healthy!